The family of an eight-year-old boy killed when a car crashed into a tree have paid tribute to a "beautiful cheeky chap". Jenson Evans died and four other family members were injured, in the crash on Smilog Forestry road, near Talbot Green, on Thursday evening. His younger brother and parents have been released from hospital but his elder brother is still being treated. 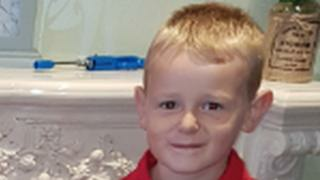 In a statement, Jenson's family said he was a "sweet, loving and placid" boy. It continued: "There are no words great enough to describe our love for you and the loss we feel, never happier than outdoors playing and usually covered in mud from playing football, you were football mad. "We will miss those night time cwtches and your kiss before bed. "An amazing son, brother, grandson and great grandson, cousin, nephew and friend we will miss you forever." Police want to speak to anyone who saw the crash, those who stopped to help, or anyone who saw how the Seat Altea involved was being driven before the incident happened. Ynyshir and Wattstown BYCFC paid tribute to Jenson on its Facebook page: "Jenson was a super, super little footballer who was a pleasure to coach and a little gentleman who always had a smile on his face. "We were proud to have him in our club and he will always be remembered."